Are you overcommitting? How to wow them AND take control of your workload. Recently a friend described her work situation at a nonprofit. Her manager has been in the role for one year and is planning the group’s project schedule for the year ahead. The past year has been a difficult one with a tremendous amount of work for a team of only three. Ten to twelve hour workdays are the norm and her manager regularly sends email throughout the weekend. As the team reviewed the manager’s proposed project schedule, my friend saw her manager headed in the same direction again, with an aggressive project schedule for the next fiscal year. “Let’s not overcommit ourselves,” my friend suggested to her manager. “We need to develop a plan that we can all deliver on and live with.” Fortunately the manager saw the wisdom in my friend’s advice and scaled back the plan to a more reasonable schedule of projects. Why overcommit in the first place? My friend believes that her manager is driven by the desire to prove herself worthy of her position and demonstrate how productive and valuable her group is to the organization. Often internal competition, the need to prove ourselves, or real or perceived demands from above push us to overcommit limited resources. It is a common frustration for many of our clients and creates undue stress and conflict for employees. A more strategic approach is to under-promise and over-deliver. Make commitments that you can reasonably achieve without overloading your team and pushing to the limits. And then when you deliver the report two days early or complete ten major audits instead of eight for the fiscal year, you send a message that you are able to go above and beyond and exceed expectations. Where are you overcommitting? 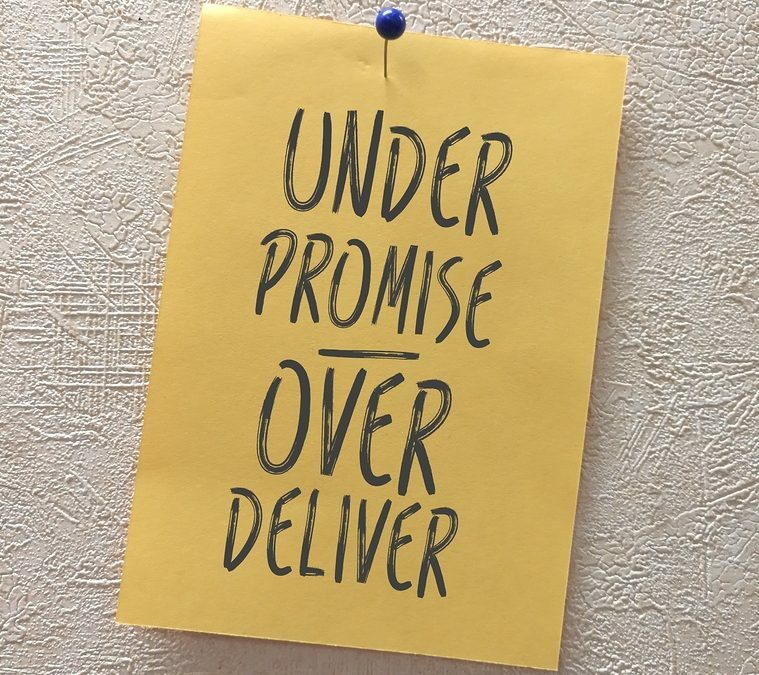 How can you underpromise and overdeliver – and wow them? To learn more about taking control of your workload, contact Robyn at rmcleod@chatsworthconsulting.com.